If you have spent any amount of time reading through our website or these blog posts, it is probably clear that we think (along with many organizations) that proper ventilation is a fairly big deal. A properly ventilated bathroom can benefit you and your home by removing odors and more importantly, humidity that can cause the build up of mold and mildew. A big issue is that the fan needs to be turned on to be effective. There are host of reasons why it doesn’t get turned on, but there is a way to override almost all of them – adding a motion sensor. A motion sensor works by turning the exhaust fan on when it detects the room is being occupied. Once it no longer senses motion in the room, it will stay on for a preset amount of time and then turn off. It will run for longer than the room is occupied to make sure any residual steam or moisture from a shower is exhausted out of the room. The automation is the key part of this. There is nothing to turn on or off. This is especially great for rental properties where occupants might not be as diligent as you might want them to be with the ventilation of the home. Adding a motion sensor can be done fairly easily. If you need to install a new fan or replace an existing one, there are many options that have a built in motion senor. If replacing the fan is not something you need to do, motion sensing wall switches are available. These simply replace the current switch the fan is wired to. To learn more about integrated motion sensing fans or motion sensing wall switches, visit www.airkinglimited.com. 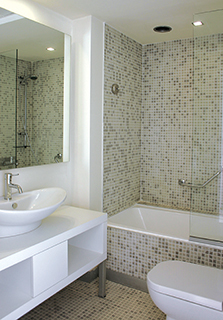 Thinking about how to improve your bathroom might not be something you spend a lot of time dwelling on and if you do it is probably how you want to replace the vanity, that new shower head or even how you are going to completely remodel. Even when you clean the bathroom, probably more thought goes into what a hassle it is and how much mildew is building up after just cleaning it. While a complete remodel of the bathroom might be out of reach, there is a fairly simple upgrade you can make to your bathroom that will at least help with the cleaning process – adding a humidity sensor to your exhaust fan. A humidity sensor will automatically turn the exhaust fan on when the humidity level of the room reaches a preset point and will stay on until it falls below that point. Here is how it works; you start the shower, which instantly raises the humidity level of the room so the fan turns on. After your shower, there will still be residual humidity in the room, so the fan will continue to run until that humid air has been exhausted out of the home. This helps prevent the build up of mold and mildew, both like warm humid environments. As an added bonus, it is all automated, nothing for you to do. Adding a humidity sensor can be done fairly easily. If you need to install a new fan or replace an existing one, there are many options that have a built in humidity senor. If replacing the fan is not something you need to do, humidity sensing wall switches are available. These simply replace the current switch the fan is wired to. To learn more about integrated humidity sensing fans or humidity sensing wall switches, visit www.airkinglimited.com.